Nandlal Bose was born in 1882 in Monghyr Dist, Bihar. His father Purnachandra Bose was the estate manager and architect of the Maharaja of Darbhanga. He studied at the Calcutta Government College of Art under Abanindranath Tagore between 1905-10. While studying in the College of Art, he won a scholarship, and in 1908 also a prize for his painting Sati Mounting the Pyre. Since then his artistic pursuits and success became companions, providing him respect, admiration and all sorts of worldly and spiritual honours. He joined the team of Lady Herringham and assisted in making copies of Ajanta paintings in 1910-11; this brought him into close contact with the greatest masterpieces of Indian art. As soon as he finished his college education, the principal, Percy Brown, invited him to teach at the College of Art; instead he preferred to avail of the facilities to work at Jorasanko offered by Abanindranath Tagore where he came into contact with Ananda Coomaraswami, Sister Nivedita, Okakura and Rabindranath Tagore whose literary manifestations he enjoyed illustrating for years to came. Rabindranath asked Nandalal Bose to build and head the art department at Shantiniketan in 1921. Nandalal believed in exploring the uniqueness of the Indian genius as revealed in the long tradition of Indian art. It was his firm conviction that an Indian artist must learn an authentic language, which is in harmony, and is compatible with his spirit, in order to respond to the emerging new era of art. The tension and warmth that saturated his works were a reflection of a conscious, creative personality engaged in the rigorous endeavor to evolve and project an image of Indian modernity. Nandalal’s mental makeup was in complete resonance with Rabindranath’s attitude. 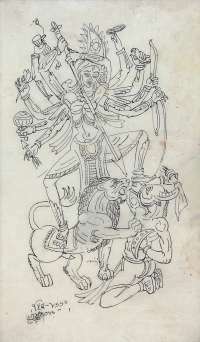 Nandalal never adhered to any particular technique or medium and continually vented his creative urge in diverse forms. Nor did he influence upon any of his students or interfere with their personal development. He also believed that an artist could not be created. A teacher of art could only assist a student-artist’s self-development. This freedom and an absence of academic rigidity certainly contributed to the emergence of talent with distinct individuality. At the Faizpur Congress Session in 1936, Nandalal built a township using only rural material and employing country craftsmen. In 1937 Nandalal was again called up by Mahatma Gandhi to make an exhibition. clearly visible to the rural people passing by at the Haripura Congress Session. These paintings are now famous as the Haripura posters. He taught at the Indian School of Oriental Art and was principal at Kala Bhavan, Santiniketan between 1922-51. Since 1911, Bose has exhibited in several national and international exhibitions such as at Crystal Palace, England (1911), the 22nd exhibition of the Societe des Peintres Orientalistes Francais, Grand Palais, Paris travelling to Belgium, The Netherlands & Imperial Institute, England (1914). Travelling Exhibition organized by the Indian School of Oriental Art and the American Federation of Art (1924), Athenee Gallery, Geneva, Switzerland (1928), Lucknow and Haripura Session of the Indian National Congress (1937, 1954). Bose retrospectives were held at Calcutta in 1954 and at the Centenary Retrospective Exhibition, National Gallery of Modern Art, New Delhi (1982). Of the many artists thrown up by the revivalist movement at the turn of the century Nandalal Bose was the best and the best known. He was the one with the Midas touch in terms not of commercial valuation but of artistic impact. Even today his art is as relevant as ever before. In his first phase, he excelled in the wash technique and his compositions and drawings gradually became firm and design oriented. His second phase, he explored and re-interpreted the traditional sculptural forms and folk paintings of Bengal. It was a significant shift from the epic-puranic watercolour wash to the vibrant Linear expression of the life of the common people. Lastly, in his most endearing phase Nandalal fused the Japanese sensibilities for the unadorned linearity of forms in untreated pictorial space with tribals, the trees, the mountains and vast open fields. Nandlal Bose died in 1966.